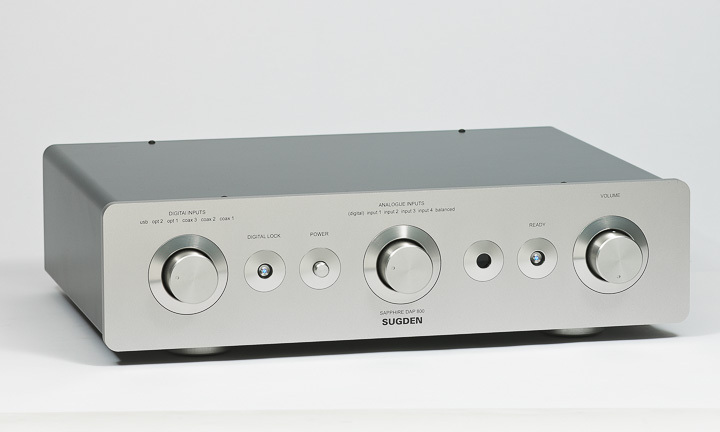 For just over half a century, for almost as long as there have been transistor amplifiers in fact, there has been Sugden. The company moves to its own beat; it makes amps that don’t follow the trend, and makes products that sound truly lovely in the right systems. The Sapphire range is the latest from a brand that cycles its products about once in a generation. ‘Range’ is probably an ambitious way of putting things. There is a preamp and a stereo power amp. The DAP-800 preamplifier is designed as a bit of a one-stop-shop, with balanced and single-ended inputs, a built-in DAC… but no phono stage or network streaming capacity. The key sections of the preamp (analogue and digital) are self-contained, each having their own power supply voltage regulation and circuit board assemblies, to the point where the analogue stage uses a toroidal transformer while the digital section has its own E-core transformer. This means the digital power supplies are totally isolated from the analogue stage. The DAP-800’s analogue stage features what Sugden calls a ‘VCV’ (Voltage Controlled Volume) circuit, which first featured in its Masterclass amps, and is seen here in its latest and most developed form. This circuit has a high impedance input section and a current gain stage, which drives a folded cascode stage into a Class A output stage. The folded cascode circuit facilitates a wide bandwidth with maximum dynamics and low capacitive connectivity. The volume control does not attenuate the signal; instead it ‘informs’ the current gain stage of the correct volume level. This means the tonal balance is constant irrespective of the output level, as opposed to most potentiometers and even ladder resistor array active volume controls. S/PDIF output signal is reclocked and dejittered by the Wolfson interface transceiver. This DAC configuration has been adopted for Sugden’s digital processing after many many hours of auditioning of a wide sample of DSPs. It was first used in the company’s Masterclass DAC-4 processor, and – with Sugden no longer building the CD player to match the A21 – the DAC-4 and DAC built into the DAP-800 represent the company’s main digital ‘push’.